IPKat is delighted to learn that the 5th edition of the authoritative (did one hear "iconic"?) 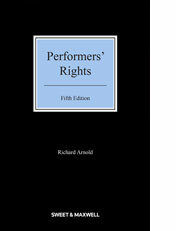 work, Performers' Rights, by Sir Richard Arnold, Patents Court, England and Wales, has now been published by Sweet & Maxwell. This Kat still remembers how excited he was when he received a review copy of the first edition of the book and here we are, with the 5th edition already in print. 3. Assembling supervision services, assembling, dismantling, installation and start operations for equipment and/or machines". The IPKat wonders to what extent the courts or other administrative bodies will be called upon to construe some of these terms. International Conference on Innovation—Bar-Ilan University and the Ono Academic College are sponsoring an international conference, "The Many Faces of Innovation", to be held on January 5-6, 2016. The program is in memory of Alberto Musy and it is of particular interest given the broad view of innovation that the organizers have taken. IPKat hopes to report on the conference. Some Kat readers may have followed reports about the devastating rains that fell on Chennai in southeast India. SpicyIP has received a tip that rains found their way into the IPO office in Chennai and that a certain number of files were damaged. It appears that efforts are being made to restore the files by drying them out. Given predictions that further rains are expected in Chennai, it is hoped that restoration efforts will be completed soon.